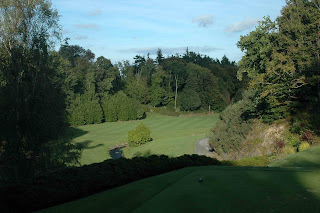 How long does it take to get from Mount Juliet Golf Club, in Thomastown, Co. Kilkenny, to Druid’s Glen near Newtownmountkennedy in Co. Wicklow? It was a question I wanted to put to Michael Goldstein and Jamie Patton as our 1.10pm tee time came and went. I know the guys at Druid’s Glen well enough that it wasn’t a problem, but it was a Friday and the time sheet was full. At this stage of the year/economy/recession (delete as appropriate) that’s good news for the club – or any club for that matter. 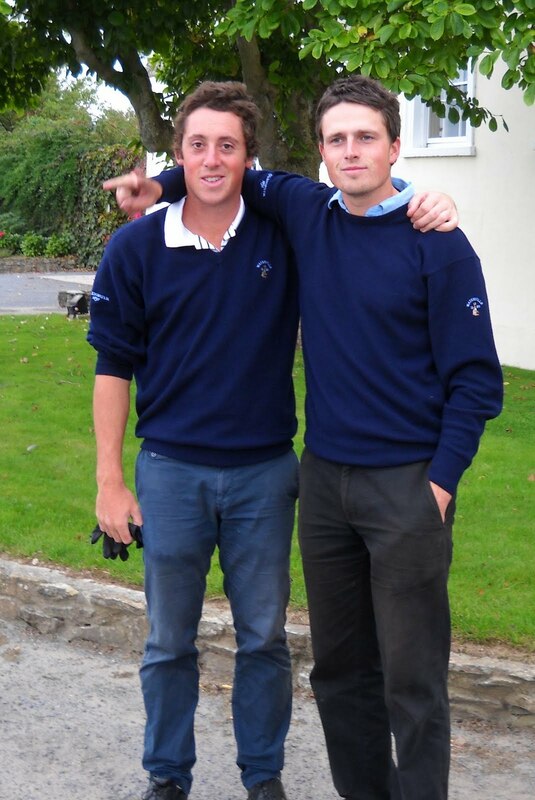 Michael and Jamie are the two Kiwis travelling around the world playing a different course every day, for a year. You’ve probably heard of them. They’ve played across New Zealand, Australia, the USA and Scotland and here they were, coming to the end of their three and half week trip to Ireland. Their website is www.puregolf2010.com and they’re raising funds for a charity called First Tee, as they go. Take a look at their excellent blog and you’ll get an idea of just what’s involved in their travels. To most people, the idea of a year stuffed with golf at many of the world’s top golf courses is a slice of heaven. 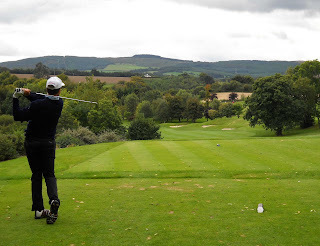 But you have to remember that this is hard work: travelling all the time, doing media interviews, arranging tee times and accommodation, taking photographs, blogging and playing golf… lots of golf. Boy, it’s a tough job, but someone’s got to do it! We’d been in touch a few times over recent months, discussing their Irish tour and deciding where and when we could meet up. We finally settled on Druid’s Glen. 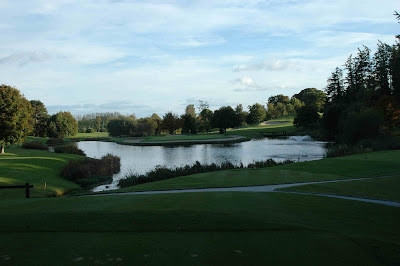 My love of this club is well documented and alongside Adare it is my favourite parkland. They were coming from Mount Juliet, so it was going to be interesting to see how the guys compared the two. Along with Carton House (Monty), these were the only three parklands they were playing down south. The bulk of their golf was on links courses, and these read like a Who’s Who of Ireland’s (and therefore the world’s) top courses, from Royal County Down to Waterville. When Michael finally arrived on the putting green he did not look 100%. This was to be his 259th consecutive round, so no surprise that he was tired but he had a stomach bug to add to his woes. And Jamie had enjoyed a late night in Kilkenny, so he wasn’t firing on all cylinders either. Gretta – Michael’s girlfriend who’d flown in for a week or two – was, however, full of bounce. The answer to my opening question is three and a half hours. The lads got badly lost along the way. “Happen a lot?” I asked, assuming that travelling the world in a variety of borrowed vehicles and no GPS would lead to many directionally-challenged moments. “Not as badly as this,” was the reply. Bert, the Course Ranger, was very accommodating and managed to slip us in at 2.20pm, and once we’d teed off all the drama and mayhem of getting lost was quickly forgotten. The tiredness wasn’t, and for two guys playing off 2 and 3 handicaps, there were some laboured swings and lengthy detours into the rough. Druid’s 13th is famous and notorious. It is 461 yards off the white markers, and a driver isn’t always the best choice off the tee! The pictures don’t do it justice, but this is the hardest par four in Irish golf (the 12th at Druid’s Heath, next door, is a close second). Jamie and Michael found water and bushes, and then more water and bushes. 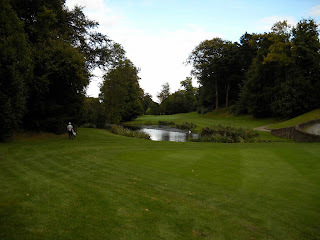 It is a hole you need to play a few times to appreciate its difficulty fully, and the guys were suitably impressed. Most top courses are judged by their signature holes. 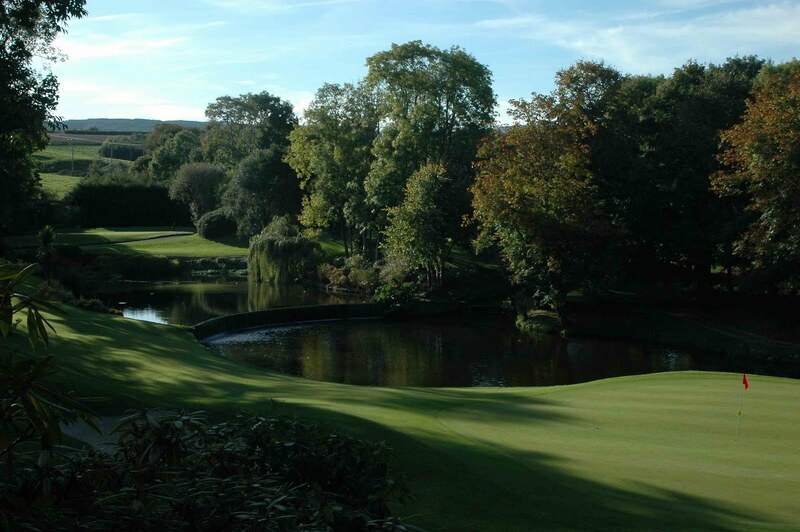 Druid’s Glen has a handful: the par threes 8, 11 and 17, the par four 18th and the 13th. A gentleman by the name of Craig Morrison agrees with me on the 13th, but more on that in the next blog. I tried my best not to ask the questions that everyone else had undoubtedly been asking, day in, day out for the last 258 days, but sometimes it was unavoidable… best course? Where did the idea come from? Financing? Tiredness? The ‘best welcome?’ question got an immediate response of ‘Ireland’. 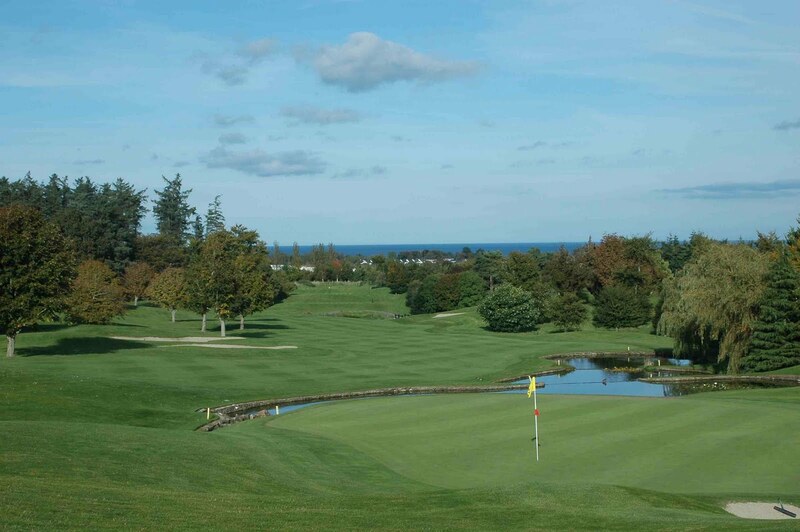 The guys had enjoyed themselves so much and been subjected to such great hospitality (Carne Golf Club received a special mention) that they were a week behind on their blog. We all know that Irish hospitality is legendary, but I was delighted to hear they were getting the full treatment. 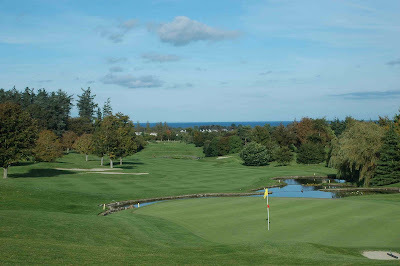 Irish golf clubs have been going out of their way to make their time here as enjoyable as possible, and that is coming through loud and clear in the tales they tell. I decided I should be direct and asked them what they thought of Mount Juliet and how it compared with Druid’s Glen. Their answer was interesting and intuitive – it is not my place to list what they said (check their blog in the coming days), but, like so many things, it proved how conditioned we have become to marketing hyperbole. They are such different courses and they offer completely different experiences. If you’ve played both you’ll know what I mean. Gretta, a non-golfer, lasted nine holes. When the 9th brought us back to the clubhouse she slipped away. She confessed that she’d not be on the golf course at all, but she couldn’t drive the 1989 Merc that the guys had been in since arriving in Scotland. “Insurance?” I asked. No, it wasn’t that. How about right-hand drive? Stupid question as they drive on the same side of the road down under. No, it was a mechanical failing. The driver’s seat was stuck well back, and Gretta – somewhat shorter than Michael and Jamie – couldn’t reach the pedals. So she got stuck at the golf clubs, waiting in the bar for her man, and undoubtedly repelling the advances of many a keen Irish golfer. I had one last question for the boys: ‘how are you two getting on together, spending so much time in each other’s pockets?’ There was a brief pause: “It hasn’t come to blows,” Jamie replied wryly. 259 rounds down; 106 to go. Let’s hope it stays that way.